Movies like Eaten By Lions are perplexing to me; their hearts will more often than not be in the right place, but they are packed with so much odd humour and strange filmmaking choices that it’s hard to really know if it’s technically any good or not. There wasn’t really a moment in this film where I found myself hating it, but at the same time some of the choices that the people behind this movie decided to use for the final product make it an extremely confusing watch, sometimes to a point where you have to seriously consider if it’s technically incompetent or not. I don’t think it’s incompetent necessarily, especially since the story and its morals are told with a clear purpose and sense of heart, yet I found it to be a rather weird watch all the same. The film is about half-brothers Omar (Antonio Aakeel) and Pete (Jack Carroll), who have been living with their grandmother (Stephanie Fayerman) ever since their parents died in the titular circumstance whilst on safari. However, when she passes away, they are sent to live with their cold and frightfully racist aunt and uncle (Vicki Pepperdine and Kevin Eldon) who want absolutely nothing to do with Omar, who was the product of an affair with a man of Indian descent. Omar decides to head to Blackpool to track down his biological father, with the inseparable and disabled Pete in tow, and together they eventually discover that Omar’s dad is a massive slacker named Irfan (Asim Chaudhry), who’s essentially a man-child and clearly in no right frame of mind to be a parent, let alone to a teenager who’s physically the same age as Irfan is mentally. It sets itself up as a 70s-era sitcom, and kind of rolls with it; there are numerous escapades that could easily fit within a traditional 20/30-minute runtime, several moments of awkward humour, countless over-the-top archetypes – Vicki Pepperdine is a cartoonishly evil figure as the racist aunt the two main characters are forced to live with at first, while Johnny Vegas also appears in an extended cameo as the owner of a dodgy B&B hotel they stay in – and increasingly hostile family squabbles. Yet, it does all of this with the stylish camerawork and cinematography of a Wes Anderson movie, complete with quirky stop-motion transitions that act as visual chapter titles; there’s nothing wrong with adding a bit of style to a story with themes and situations that aren’t entirely original, but when you place the visuals of, say, The Grand Budapest Hotel next to an episode of Goodness Gracious Me, it makes for an odd and uneven mix. You want to admire the way that this movie looks and acts, but at the same time you’re watching it in a story that really doesn’t match what they’re visually going for here. Even though the mixture of certain tones and certain styles isn’t always successful – story strands such as a blossoming romance between one of the boys and the pink-haired niece of Vegas’s character don’t fit as well, nor does some of the editing which can feel a little jarring when you’re trying to figure out in what order it’s all happening in – the film does have its heart in the right place. The chemistry between young actors Antonio Aakeel and Jack Carroll is solid, with the latter being a particular comedic stand-out; a Britain’s Got Talent finalist, Carroll won over viewers with self-deprecating stand-up material about his real-life cerebral palsy, which he also plays around with in this film to an amusing degree, and for someone who got his big break on national reality television the young guy handles himself rather well in both the funnier and some of the more dramatic scenes. They do feel like a traditional double-act, playing off of each other so well that it’s easy to identify them as both brothers and as lifelong companions, and their relationship really does serve as the film’s warm heart as a result. It’s an amusingly light, but tonally and stylistically kind of all over the place, little film that touches upon several themes of family, heritage, xenophobia and disability, and although it doesn’t explore them thoroughly it manages to mine some mild material out of them. Whether or not you laugh along with it is entirely down to you, know that it’s not an especially laugh-out-loud film; there are some chuckles here and there, but don’t go in expecting the next best thing in comedy. It’s definitely got the feel and pacing of a traditional sitcom, and often even the stylings of a screwball comedy, although for every joke that does land there’s a couple more afterwards that don’t land quite as daintily. But it’s not a truly terrible film – a little uncertain of itself, sure, but not terrible – as it does have a clear sense of heart and goodwill that help it overcome some of its rockier moments, of which there are unfortunately more of than there are smoother ones. 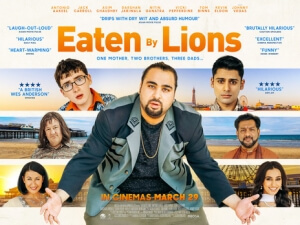 Although, it’s difficult to say whether or not Eaten By Lions is worth recommending or not; for many, I can see the odd sense of humour and stylistic choices putting some people off, as well as some of the over-the-top performances and not entirely original story. But I would say that it’s worth sticking around for, if only to see the sweet main relationship that’s just about holding it all together. Eaten By Lions is a tonally and stylistically uneven comedy outing that misses more than it hits, with some over-the-top performances and its sitcom level of jokes, but it’s just about held together by a charming central relationship between the two main characters.